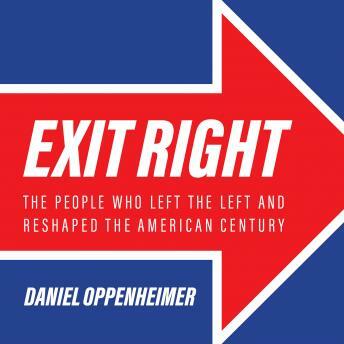 In Exit Right, Daniel Oppenheimer tells the stories of six major political figures whose journeys away from the left reshaped the contours of American politics in the twentieth century. By going deep into the minds of six apostates-Whittaker Chambers, James Burnham, Ronald Reagan, Norman Podhoretz, David Horowitz, and Christopher Hitchens-Oppenheimer offers an unusually intimate history of the American left and the right's reaction. Oppenheimer is a brilliant new voice in political history who has woven together the past century's most important movements into a single book that reveals the roots of American politics. Through the eyes of his six subjects, we see America grow, stumble, and forge ahead-from World War I up through the Great Depression and World War II, from the Red Scare up through the civil rights movement, and from the birth of neoconservatism up through 9/11 and the dawn of the Iraq War.